Published on March 9, 2015 in General T&T, Media, MSJ, People's Partnership and Politics. Closed Tags: David Abdulah, Politics, T&T Govt. Movement for Social Justice (MSJ) political leader David Abdulah has dispelled speculation that his party would be joining forces with other political parties in the upcoming general elections scheduled for later this year. Instead, he said the MSJ had ‘conversations’ with individuals in TT “who are equally upset about what is taking place in the country”. Published on September 7, 2014 in COP, Elections, General T&T, ILP, MSJ, NJAC, PNM, Politics, Religion and UNC. 22 Comments Tags: Politics, Raffique Shah, T&T Govt. Archbishop Joseph Harris strikes me as being a “rootsy Trini”—a prelate who commands respect beyond his flock even as he exudes a tremendous sense of humour. What I could not discern from a distance (I’ve never met the good Father) is that he is also a humorist who can put veterans such as Paul Keens-Douglas and “Sprangalang” to pale on any stage at any time. Published on April 20, 2014 in General T&T, ILP, MSJ, People's Partnership, Politics and UNC. 3 Comments Tags: Barrington “Skippy” Thomas, David Abdulah, Jack Warner, Politics, Raffique Shah, Ramesh Maharaj, T&T Govt. The UNC minister or activist who mobilised a gang of hooligans to disrupt a public meeting staged by dissident Barrington “Skippy” Thomas last Thursday evening should be taken before the party’s firing squad and shot—with “goat pills”. He (or she) has done irreparable damage to the United National Congress’s image, if that is at all possible. Published on November 10, 2013 in General T&T, ILP, India, MSJ, NJAC, Opposition Party, People's Partnership, PNM, Politics, TOP and UNC. Closed Tags: Basdeo Panday, Jack Warner, Kamla Persad-Bissessar, Politics, Raffique Shah, T&T Govt. Many readers scoffed at my suggestion in last week’s column that a rapprochement between UNC/COP and the ILP was a strong possibility in the run-up to the next general elections, due no later than August 2015. I imagine diehard supporters on both sides of the divide feel deeply wounded by the abuse their leaders hurled at each other during the three campaigns conducted since Jack Warner broke with the United National Congress (UNC) and formed the Independent Liberal Party (ILP). 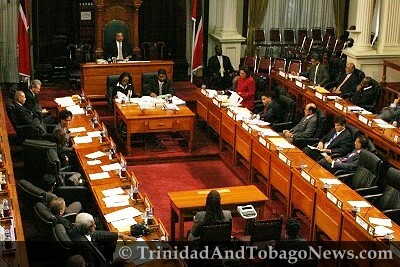 Published on June 17, 2012 in General T&T, Labour, MSJ, People's Partnership and Politics. 15 Comments Tags: David Abdullah, Kamla Persad-Bissessar, Politics, T&T Govt.